First of all, not just any ole digital TV tuner stick will work. Supposedly the best ones are based on the RTL2832U / Elonics E4000 chipset. These digital tuner sticks are not designed to work on the US digital TV broadcast standard. So, that means you probably won’t be able to buy one in the USA. 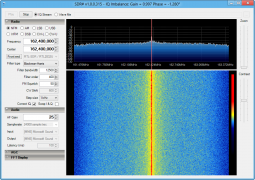 The easiest way to find one is just go to Ebay and search for SDR Radio. You will get a list of vendors selling these sticks listed for SDR use at about $20. Be sure to check that the stick is using the RTL2832U / Elonics E4000 chipset. Most of these vendors are in China, so expect it to take about two weeks to get to your QTH. I got one of the white ones from runtek88. 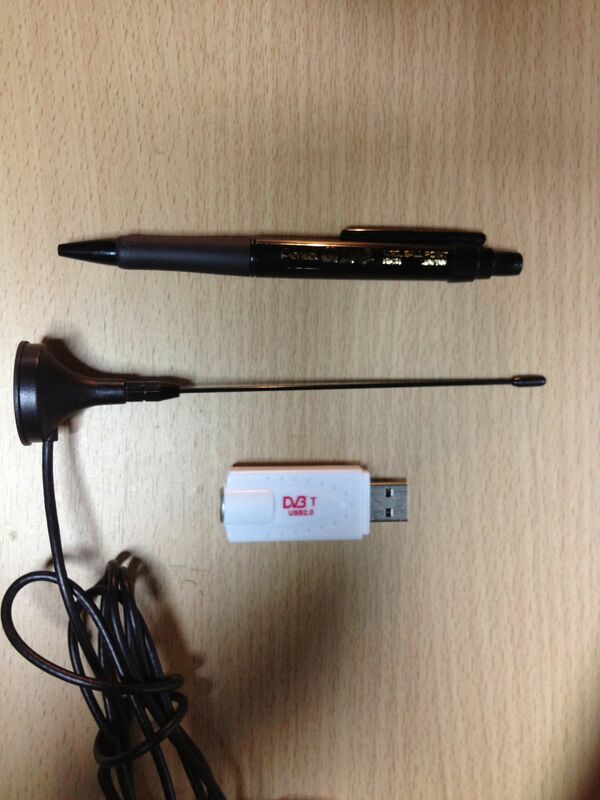 This unit comes with the usb stick and an antenna. No box, software, and no instructions. I guess you don’t really need them, since the DVB-T stick is pretty much useless for anything else except for the application of it as an SDR radio. Some come with a remote which is also pretty much useless. The sticks are also very small. First of all, you can pretty much throw the antenna away that the stick ships with. You will find that it won’t pick up muchmore than some very strong local FM broadcast stations. I am sure that some folks have been mislead to think that their DVB-T stick wasn’t working because of this poor antenna. The DVB-T stick is not super sensitive to begin with and a poor antenna will make it even worse. You will need to use a good VHF/UHF antenna with some gain in the bands you want to listen to. It would also be a good idea to use some low loss coax and keep it as short as possible. Mounting the antenna outside if possible would even be better. One thing to note, is the DVB-T stick doesn’t have a lot of RF filtering in the front end. So strong nearby radio signals could cause the tuner to desense or become overloaded with images. The first thing you will probably notice about the stick, is that it has a Pal TV connector on the end. 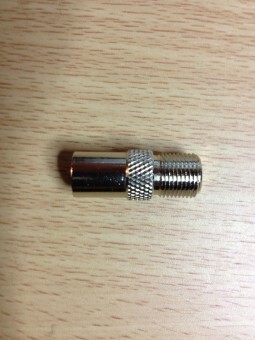 It looks like a standard RCA connector, but a male RCA connector will not fit. Fortunately, Radio Shack stocks a Pal TV to F adapter. You can get several F to whatever adapters to connect an existing antenna to. Next you will have to install the drivers, ExitIO controller file, and the SDR software package you intend on using. There are various software projects popping up to support the RTL2832U dongles, but I would highly recommend starting of with an HDSDR installation first, just to be sure everything is working before moving on to other software projects. Use these instructions to get your stick and software installed. During the driver install, you will be asked what device to install the driver to. The instructions say to List all Devices, do that and you may see a device listed as RTL2832U, choose that one. Once you have the drivers installed run HDSDR. If you are asked to set up your soundcard, you only need to be concerned about setting the output. The input settings will be ignored since the sound input comes directly from the usb stick. 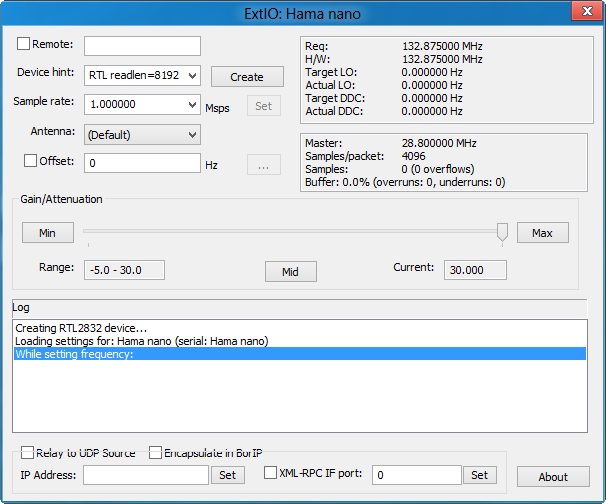 If the ExtIO is not already open click on the ExtIO button within HDSDR. Make sure the gain slider in the ExtIO panel is set to about 3/4 of the way up. By default the gain is set to low, and you probably won’t hear anything. 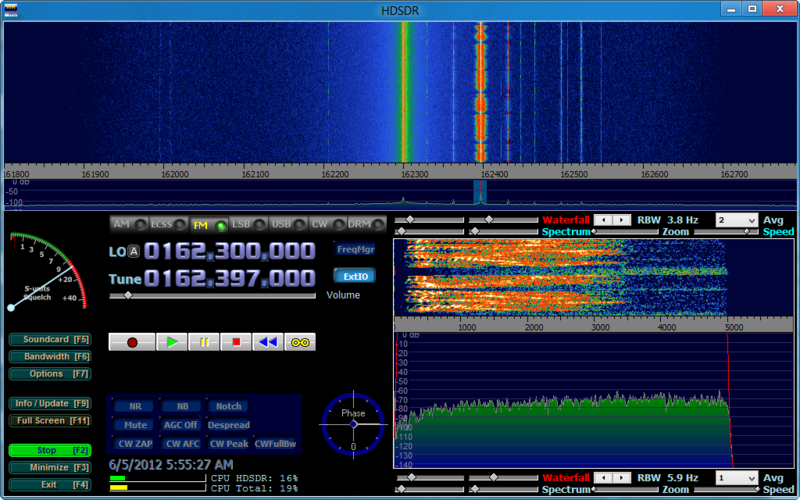 Once you have HDSDR operating, you might want to give SDR# a try. SDR# has been modified to work very well with RTL2832U usb dongles. It has it’s own custom ExtIO file for the RTL2832U with Automatic Gain Control so you don’t have to setup the gain unless you want to. It will also do WFM very well were HDSDR does not. 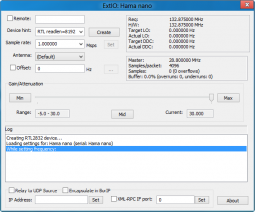 For now, to get RTL2832U support you will need to download the Dev version here. Ok this is all kind of theoretical and changes depending on the DVB-T chip set and software / setup. Typically the RTL2832U / Elonics 4000 chipset frequency range is 64 – 1700 MHz with a gap at 1100 – 1250 MHz. When using the standard HDSDR the SDR bandwidth shown on the spectrum display is about 1MHz while the SDR Sharp display defaults around 2MHz. Supposedly the bandwidth can got to around 3MHz with tweaking. I have not tried to go above the SDR Sharp 2MHz setting, but some users have gotten the bandwidth up around the 3MHz range. settings you use. Remember, that the DVB-T stick can be desensitized by strong nearby signals. Performance will depend again on the software / settings combo, as well as how powerful your computer is. Even though the software will run on very modest specs, you would like something with a dual core processor built in the last 5 years or so. My testing of the RTL2832U / Elonics 4000 based DVB-T was a mixed bag. First of all let me say that for $20 SDR radio, the DVB-T stick is a pretty good deal and performed better than I thought. I found sensitivity a bit lacking with a unmodified DVB-T stick (no outboard preamp). Using the stock antenna, I managed to pick up a few local FM broadcast stations and barely a nearby NWS station. After getting an Pal to F converter, I connected my attic discone antenna. On the discone I was able to pick up distant FM stations (about 60 miles) and a few ham repeaters. Overall though my DJ-X11 on a rubber ducky did better. However, even though the DJ-X11 is SDR capable, it can’t show 2MHz of spectrum. The DJ-X11 also costs 17 times more. To be fair the discone I used for testing doesn’t have much gain, is not outside, and suffers from loss due to a long cable. So at the end of the day, I am sure that the DVB-T stick would do better with a high gain outside directional antenna. I would have to say that theRTL2832U / Elonics 4000 DVB-T stick is well worth the modest investment if want to play around with VHF/UHF SDR. There are various videos on Youtube showing the stick being used from decoding ACPO-25 to satellite reception. The cheap DVB-T stick SDR has opened the door for more people to get involved with SDR experimentation. There is no telling what cool applications may show up! Discuss this topic in our RTL2843U Forum! I am sure that some folks have been mislead to think that their DVB-T stick wasn’t working because of this poor antenna. you are right. it’s about me 🙂 thank you very mush for your post. I have bought two DVB-T USB devices which is just same as at the picture given this web site. My aim was to use these devices as a SDR (Software Defined Radio). But unfortunately both of them have been broken down immediately when they are connected to external antenna because of absence of ESD diode at the pin of antenna input. For this reason, to be sure, I have decided to make autopsy. I have seen that there was a place on PCB for ESD but there was no ESD diode on that place, although ESD diode is strictly recommended at the data sheet of E4000 chip. May be this is my chance as a Turkish Radio Amateur. For this reason I can not suggest this brand of device to my friends who are radio amateur. This can be a problem with these DVB-T sticks. The very first one I tried new out of the box had this problem. I have bought a couple of others, and they have been fine. You should see if you can return them. Quality control can be a problem with these devices since they are produced so cheaply. 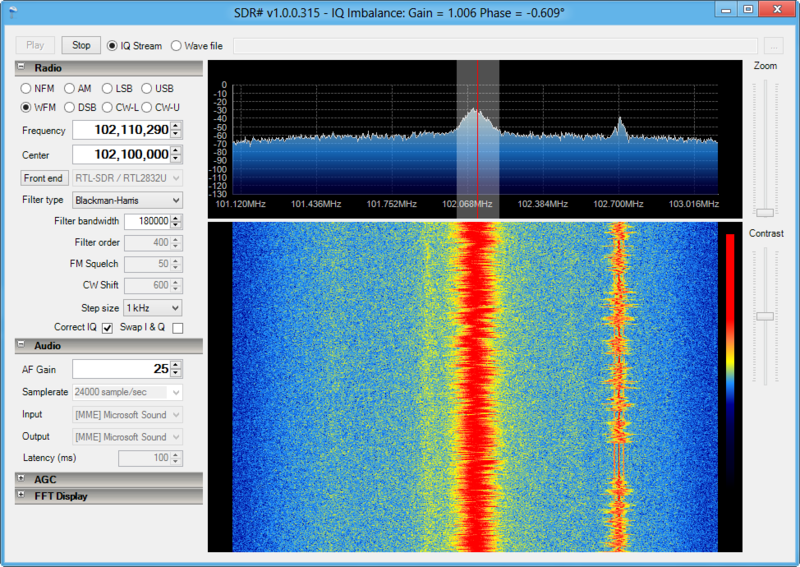 I understand that a more robust version is in the works specifically for SDR use. I hope to get one in the near future for beta testing. Ok, so I got the dongle and HDSDR (plus IOExt driver) – it all worked, but pretty much a worthless exercise – the most I could pull in were local FM broadcast (after changing sample rate to 96000). Even keeping sample rate to 12000, and trying to tune around the Ham HF bands, just resulted in nothing. ZERO. What is the lesson? YOU CAN’T EXPECT TO PAY $20 FOR AN AWESOME SWL RECEIVER!! On the other hand, I expected to be able to pick up Hams in the next town, but all there was was hisssssss…. RTL2832U / 4000 Dongles do not receive HF. They only receive FM/UHF/VHF. The RTL2832U / R820T dongles will receive in roughly 24MHz to 30MHz band allowing for 10M amateur radio reception. If you really want to utilize HF, pick up one of the $50 Ham it Up HF converters that we have mentioned on the site. When you get it all cabled up, the RTL2832U device and the converter make a very decent HF SDR radio. De mi experiencia de radioaficionado me parece que la instalacion antenas exterior sintonizada mejora la recepcion y para completar tecnicamente los filtros pasa banda para evitar saturacion de estacion de potencia . So in fact the whole thing works out NOT to be as cheap as it looks at first. Hope that someone will get back to me with good news.